Showing results for tags 'f-15i'. 3.3- Added F-15I_Raam decals folder as it occurred to me not everyone has that specific Raam decal folder name 3.2-Fixed an error in the F-15I Ra'am's AIrcraftdata section and updated all variant's gross weight's thanks to Fanatic Modder bringing to my attention that the wing pylons weights were added twice to the aircraft's mass. Also more refinements to the AI statements for happy wingmen! 3.0- Best update yet! Redone AI statements for all Strike Eagle Variants, your wingmen and all AI will finally be able to drop dumb bombs on target! 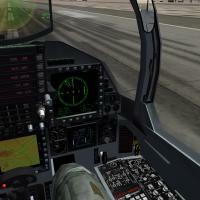 Also fixes AI strafing runs and the Strike Eagles will be able to strafe ground targets with accuracy! Also added some nice hanger and loading screens to the F-15SG as some extra eye Candy! Enjoy your new wingies! Update 2.5-Fixed CBU Attack loadout! Updated FM even more! Suggestions always welcome! This is a FM and loadout enhancement package first started by Crusader to kinda bring the Strike Eagle family more up to date with recent advances in SF2 modding ability! This mod changes the order of release for the CFT weapon stations and allows for more customized loadouts in the loadout menu before a mission. These changes along with a new STRIKE loadout of MK82's allows the AI to more easily hit a target. 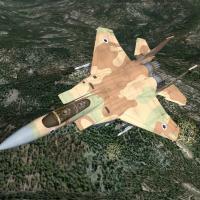 The FM changes are just updates to the FM and more realistic gross weights/Loaded weights etc and should help the AI better manage Flying the Strike Eagle and all its variants. Small updates were also made to the LANTIRN systems of all the jets. Also is an updated F-15i skin touched up by me. 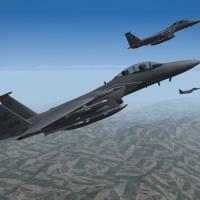 This pack covers the F-15 Strike Eagle variants from FastCargo's F-15 Super Pack including the F-15E F-15E_04 F-15I F-15K F-15S and F-15SG Now we just need a new strike eagle cockpit! 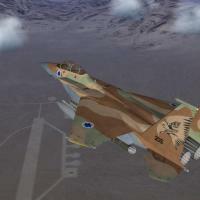 Thank you especially to Fastcargo for his F-15 pack and crusader for starting the FM mod, and anyone else who has contributed to the F-15's and everyone on CA! If I've messed anything up feel free to PM me and I can see what I can do to fix the issue! Happy SCUD Hunting or Iranian nuclear bunker busting!